SYNOPSIS: There have been many great movie sequels. There have even been prequels. Now, get ready for the world’s first SQUEAKQUEL, in which superstar ‘Munks Alvin, Simon and Theodore finally meet their match…in newly arrived female trio, the Chipettes. REVIEW: In December 2007 the first Chimpmunks film was able to generate over $300 million dollars worldwide at the box office. So it is no surprise that after that extraordinary success, a sequel will follow. Two years after the hype, 20th Century Fox is releasing "Alvin and the Chipmunks: The Squeakquel" in an attempt to match and not surpass the original. Let me begin by saying that I have never been a fan of Alvin and the Chipmunks. I found their quirky voice annoying and just plain absurd. So as you can guess, I was not involved in the Alvin revolution two years ago, and to be honest, I haven't even watched the first film. With that in mind, I decided to give the squeakquel a chance. I wasn't expecting much out of the film, however after the success of the first I was hopeful to find something special. To tell you the truth I didn't found anything special, but I was really entertain. I was able to enjoy a 88 minutes of a decent family outing. 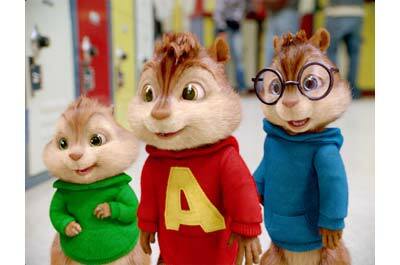 The story in this sequel takes the chipmunks to High School. Creating funny situations that many parents and kids will find familiar. This sequel also see the addition Chipettes which many will find cute as the performs Beyonce hit " Single Ladies". In terms of special effects. the film takes the Chipmunks to another level, The evolution of CGI after 2 years gave a better definition to their moves and gestures. Overall with music and innocent jokes "Alvin and the Chipmunks: The Squeakquel" manage to provide enough entertainment to make the film a decent squeakquel.